Testimonials from Our Customers| B.I.G. As the Project Engineer at Department of Energy Headquarters who has overseen the design, construction and installation of four of your booths in the last two years, I just want to take a few minutes to let you know how happy we are with your products and your company. I have been around long enough to know that projects of this type often hit little bumps in the, road. A seam may not be properly sealed or an improper light fixture installed. These things happen. What is far more important is how these events are responded to - and in the case of B.I.G. Enterprises, they have been consistently responded to with professionalism and a commitment to customer service. You folks are doing it right - and it is appreciated. What was even more impressive is the way you responded to the failure of a bullet resistant window in one of our booths. Even though we reported that there is a likely impact mark, you have offered to send us a replacement window at no cost. This is truly taking customer service a step above. Thank you again. Your products and service have been exemplary. 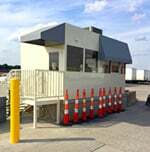 "We wanted our guard stations to be substantial and well done with excellent workmanship, fit, and finish. We asked B.I.G. to go where many manufacturers can’t go. The security department was very impressed. We’re very, very happy with the booths; they are really outstanding. We’re getting another B.I.G. booth, which says it all." "Our company has a history of continuous growth and careful expansion. I wanted a gatehouse that could be weather tight, attractive, and moveable - especially since we are planning for growth. I was looking for the most value for the dollar because I knew if I misjudged the quality for cost for the gatehouses, it would be a long time before I would have a chance to correct my mistake. My decision was mostly based on a gut feeling I had when speaking with the vendor, and seeing the higher quality of their web site and their larger selection. My decision was confirmed and reconfirmed with every interaction I had with the company. They really worked with us to get us squared away in no time at all. After 9/11, the Food Safety inspectors from the FDA were getting the heat turned up on them by the Office of Homeland Security it went all the way to the top. We told the vendor getting our gatehouse was critical to the safety of our operations, and they got it here a week early! Protecting our customers was our A-number-one priority following 9/11. We wanted to be assured that we had everything buttoned-down and could affirm consumer confidence. I think we’ve succeed too, based on the positive press we’ve received in both our trade journal and in the local media. All of this is just the added benefit of having a top notch security detail that begins with our gatehouses. We did this all as a preventative measure. The fact that the FDA could shut us down if they found our plant susceptible to criminal or terrorist infiltration is no small matter either. A work stoppage like that would cost our company hundreds of thousands of dollars if not millions in lost product, salaries, wages, and profit…it would be unthinkable and we just can’t afford to risk it." "As evidenced by the length of time we’ve been working together (12 years) B.I.G.’s equipment shelters built for Costco Gasoline Operations continue to meet our expectations and serve our purposes very well. The B.I.G. 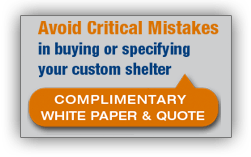 equipment shelters are durable and easy. We order them, they arrive and we just plop them down on a concrete pad. It’s much cheaper to buy prefab than to try to build them ourselves. They do an excellent job of painting—they really have painting dialed in—especially for harsh climates. Overall, B.I.G. has done very very well." We found that our operations function much better with the presence of the new scale house from B.I.G. Enterprises. After researching prefabricated structures offering custom designs, Hennepin County chose to go with B.I.G. Enterprises due to their product life expectancy and ability to meet the tough design requirements. Because of their construction quality, we expect these B.I.G. scale houses to be here for the life of our facility…a few decades. We’re really happy—the B.I.G. scale houses arrived almost fully functional. This project was done the correct way, from top to bottom. This scale house works so well, that we had B.I.G. construct a similar booth for one of our other locations. We love them! After careful consideration, WMATA found California-based B.I.G. 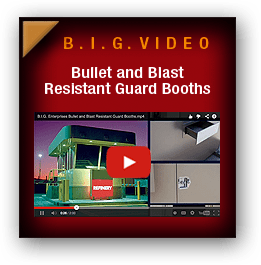 Enterprises to be best suited for manufacturing their new Sales Office due to B.I.G.’s ballistic background and Critical Span manufacturing technique that increases convenience and strength in prefabricated structures. “We wanted to use a company like B.I.G. that had standardized procedures and best practices for building these kinds of structures. Everybody who has seen the B.I.G. Sales office really likes it. In fact, they like it so much that they want to use the Sales Office as a template for WMATA sales offices in other Washington D.C. locations. I think the Sales Office is very successful. I want to compliment B.I.G. on being able to work with us. They didn’t complain about changes and they were very good to work with…they gave us what we needed. When I visited the B.I.G. facility, I saw that it was a very well run and lean ship. Quality was obvious from the moment I walked in. They had a stainless steel booth being loaded for delivery to the East Coast. I went over the welds—the butting of corners, and saw that the windows were high quality. High quality welds within mission critical applications are necessary for the safety and survival of security forces. We were pleased with what we saw at their facility. We had some special requests and B.I.G. was attentive and responsive to all of them. Their attitude was ‘yes’ on everything. From a customer service perspective, they returned every phone call promptly and we had dozens of phone conversations. Everybody worked as a team. We’re very pleased with B.I.G.’s performance that made a big difference. When the delivery truck showed up, the security manager of the nuclear plant called immediately to tell us he thought the B.I.G. booths were really top-notch and exceptionally high quality. He was extremely pleased. Examining the interior and exterior moving parts and electrical, he said that he had seen a lot of products in the industry and he would put these booths up against any of them. To insure the citizens were happy, we posted four different bus shelter models on the Internet. We invited several different organizations like the Chamber of Commerce to vote on the booth they liked the most. Though we are only a community of 50,000 people, a surprising number—one thousand persons—voted! Citizens then voted 2-1 in favor of the bus shelters from California-based B.I.G. Enterprises. The community is totally pleased with the bus shelters. According to our engineers, these are built better than any shelters they’ve ever seen. I would tell other cities that you get what you pay for. The design and engineering people at B.I.G. are extremely helpful and flexible. If you want a quality product, you buy from someone like B.I.G. There are plenty others out there that are not quality. It had everything we were looking for and then some. The booth has been working out great! It went in 'four square and solid.' We get compliments from both employees and visitors on how nice it looks. The security officers that work in there are amazed at the heater. It warms the booth up in no time. The glazing helps cut the glare a whole lot, so they can see better and they don't have constant eyestrain. The counter top has plenty of room for phone, computer, monitor, notebooks, and check-in sheets. 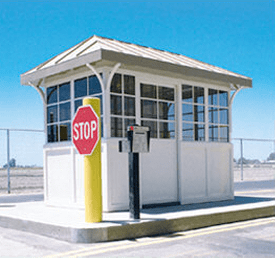 I did a lot of research about guardhouses. B.I.G. was the most professional. Everyone at the Navy is happy with it. It's the headpiece to our new multi million dollar pier. Some folks make cheaper booths, but no one makes a better booth. B.I.G. 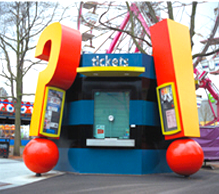 builds superior, high-quality modular booths. The highest quality in the U.S.
We chose B.I.G. because of the great selection that was available. We found something that suited the needs of exactly what we wanted. B.I.G. had the lowest bid and it's performing well. We’re able to move the booths around with a forklift. It's well designed for that. It's also designed well for heating and air conditioning, which, out here in the high desert, you need both. We love the B.I.G. booths; they look great. The public loves 'em. They really enhance our Park-N-Ride lot. With nine months of rain in the wintertime, the booths are quite helpful. We didn't want standard bus shelters—we wanted well-lit, airy, large, ADA-friendly enclosures. B.I.G.’s design (ribbed roof, powder coating, Lexan panels) works really well. We run about 300-400 people through every day. We chose B.I.G. because of a combination of price, delivery time frame, and product quality. With the convergence of all three things, B.I.G. was a clear winner. Customers Feel Respect at B.I.G. I get good service. I'm treated as a good customer, and not just another person that they're selling a booth to. I like their product. I think it's pure quality. I can highly recommend B.I.G. Metal is not a hard science, but it is an exact one. Most fabricators don't do what you ask. But with B.I.G, whatever specs you give to them, that's what you get. It's nice to see exactly what you draw, come to life. It's an architect's dream. Thanks so much for everything; I love the booth – it’s awesome. You told me that you could build a booth that matches its surroundings and you really did it. I’ve been working here for 14 years and the booth looks like the school was built around it or that it came with the campus—it totally matches our campus colors. GREAT WORK. I'm very glad I chose to go with your company. The delivery driver was super skilled and informed, very polite and got the job done perfectly. When I need to place another booth order in the future, I know exactly where I will go. Thank you, B.I.G. Enterprises.